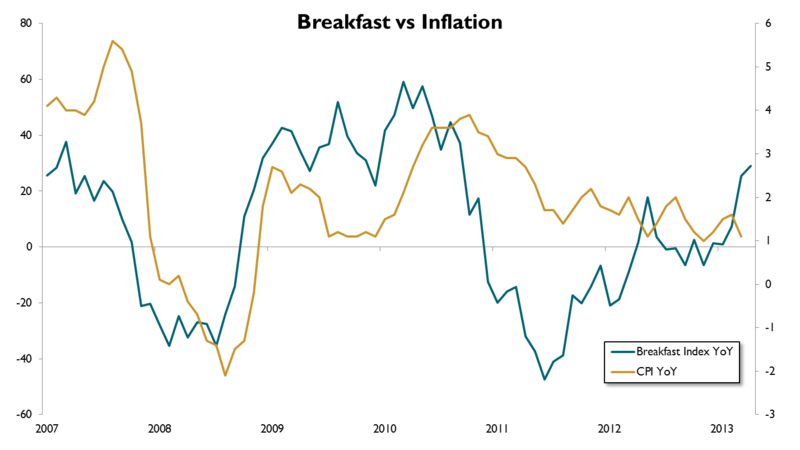 While seemingly a little over the top, the Breakfast index has actually historically been a fairly solid leading indicator for inflation. Of course, food is only one component of the Consumer Price Index (CPI), and a volatile one at that (food and beverages are 15% of the CPI). While a multitude of factors drive prices, it is interesting to see how low inflation has fallen, and the market doesn’t seem to be pricing in much for inflation expectations. How is a breakfast lover, such as myself, supposed to control the climbing Captain Crunch costs? Luckily, CLS offers an Inflation Quad ETF strategy designed to hedge against ….. inflation……, as well as the CLS Active Real strategy that invests in many of the commodities found in your breakfast bar! CLS’s inflation quad is an actively managed investment strategy which invests in eight or fewer ETFs. The strategy is designed to minimize inflation by investing in four key sectors – TIPS, bonds, commodities, and T-Bills. CLS’s Active Real strategy is an actively managed investment strategy which invests in ETFs to diversify investors away from traditional asset classes. While the primary objective of the strategy is not intended to be a hedge against inflation, this is a secondary objective. An ETF is a type of investment company whose investment objective is to achieve the same return as a particular index, sector, or basket. To achieve this, an ETF will primarily invest in all of the securities, or a representative sample of the securities, that are included in the selected index, sector, or basket. While ETFs tend to be lower in cost to other investment companies, such as mutual funds, costs still apply; refer to the prospectus for complete details on the fees associated with the security. Diversifiable risks will heavily depend on the specific ETF invested in. The primary diversifiable risk is business risk. Other diversifiable risks may apply based on the assets which the ETF invests in. Bonds are a type of debt instrument issued by a government or corporate entity for a defined period of time at a fixed interest rate. The most common risks for bonds are non-diversifiable risks, but bonds may be subject to diversifiable risks including, but are not limited to, call risk, reinvestment risk, and credit risk. High yield bonds, or junk bonds, will be subject to an even greater degree of these aforementioned risks as well as subject to credit risk and business risk. Treasury Securities are securities issued by the U.S. Government. Generally issued to fund its operations and backed by the full faith and credit of the U.S. Government, treasury securities are considered extremely low risk investments and may include: Treasury Bills (T-Bills), Treasury Notes, Treasury Bonds (T-Bonds), or Treasury Inflation Protected Securities (TIPS). The return on treasury investments is measured by the Treasury Yield. The primary diversifiable risk is opportunity risk. Investing in commodities refers to investing in trade goods used in commerce. When traded on an exchange, all commodities must meet a minimum acceptable grade called the Basis Grade. Diversifiable risks may include, but are not limited to business risk, capital risk, and regulatory risk.